In a grand royal procession recalling the god's epithet as Kataragama Divya Rājōttama ('Divine King of Kings'), the Kataragama God (above) and His entourage of officials and servants (below) pay a stately visit to Valli Amma every evening of the fortnight-long festival. 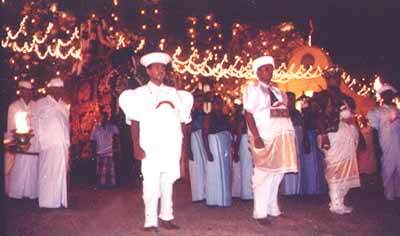 There was a festive mood in Kataragama during the past two weeks, since it was time for the annual perahera. And on all days, commencing July 16, the pageantry on the streets was as colourful as ever. The inaugural procession, the Magul Perahera, commenced at the auspicious hour at the Valli Amma Devalaya. There were thousands of pilgrims who had come to the area to witness it. On the second day the perahera began at the Maha Devale, going once a round the Devale, then passing along the Pita Veediya, and finally heading to pay homage to the gods. Thereafter it moved to the homage Maha Devalaya. This ritual was followed for 14 days. On the 27th and 29 two special processions were conducted. 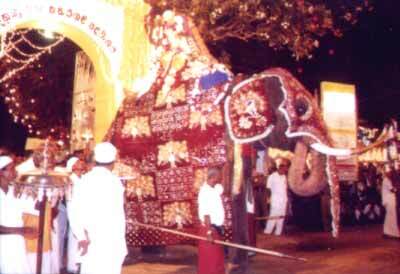 They were known as Deviyange Perahera or God's pageant, the Maha Perahera, the major event was performed on the 31st. It proceeds that night up to Kiri Vehera and for this ceremony a large bag of coins taken from the Kataragama Devale was offered to the deities. Thereafter the procession traveled up to Valli Amma Devale. At the Valli Amma Devale, rituals were performed before returning to the Maha Devale. The final perahera was conducted at 4 am.  On its return through the Meda Veediya it stopped at the place known as Mahanadathanpola. At this spot, the drummer known as Panikkiya beat an anthem called Weeranam, with the objective of driving away all malific influences gathered in the course of the perahera season. Thereafter the deities were invoked and the Muruthen Piyawe was offered. 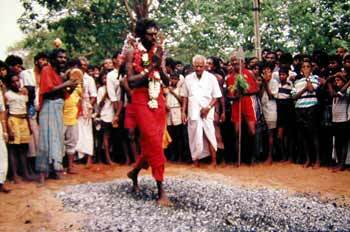 There are several legends regarding the traditional activities at the Ruhunu Maha Devale. It is said that King Dutugemunu met God Kataragama at the place where the water cutting ritual is performed even today. The King had asked for God Kataragama's favours to win the war against Elara. On that occasion the deity had proclaimed, "Go to war. My blessings are with you. Victory is yours." The King had made a vow to build a palace with a golden roof for God Skanda if the country was united under his rule. And after he had won the battle, he had come to Vedihiti Kanda to meet God Kataragama to fulfill his vows. Then God Skanda had taken an arrow and fitted it to his golden bow. He had fired the arrow from atop the Vedihiti Kanda and told the king to build the palace at the place the arrow would fall. King Dutugemunu constructed a palace at the place where the arrow fell. He also appointed servants to perform the religious rites and offered lands to maintain the place. The servants were divided into two categories as Nilapangukarayo and Praveni Pangukarayo. Nearly 12,700 acres belonged to the Devale. Prior to the conclusion of the Kataragama perahera, the traditional fire-walking ceremony is held in the sacred premises at a place between the Kataragama Devale and the Valli Amma Devale. The devotees who prepare themselves for the event by abstaining from meat and other vices, engage in deep prayer and meditation, and seek the God's blessing for participation. The pilgrims walked along a rectangular area strewn with a thick layer of smoldering embers which was prepared by burning a pile of logs laid out on the ground. There have been instances of people sustaining burns for having walked through fire without the pure devotion and purity required for the event. This year about 25 persons required medical attention. Somipala Ratnayake, the Chief Kapurala at the Kataragama Devale, said that people come to Kataragama to seek solution for various problems for which they have no other recourse. 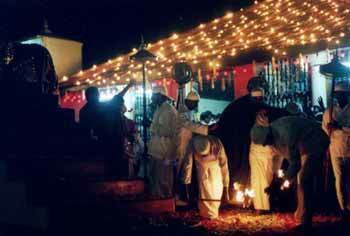 In addition to Buddhists and Hindus people of other faiths constantly pay homage at Kataragama, too.